The Irshad Hotel is the first private hotel in Azerbaijan. Built in 1996 the hotel since then has got a positive image and its own permanent clients. The hotel offers 16 rooms including 7 DeLuxe Double rooms with two separate beds and a balcony, 6 DeLuxe Twin rooms with a separate bedroom and a living room, 3 Luxe Apartments including a hall, a kitchen and two separate bedrooms. Each room features air-conditioning and heating systems, satellite television, refrigerator, minibar, jacuzzi, international telephone, hair-dryer, Internet access. Separate rooms for non-smokers and disabled guests are available. The Irshad Hotel offers facilities for organization of various events and occasions. The Eastern hall is capable of receiving from 60 to 90 persons, it is suitable for conferences, presentations, news conferences and workshops. The meeting hall is intended for 12 persons, it is suitable for interviews and business meetings. Equipment of the halls includes: a rostrum, an overhead projector, a screen, a video player, a TV-set, an audio player, flip charts. A multimedia projector and equipment for simultaneous translation are provided for extra charge. At the business centre guests can find help in written translation and interpretation. Event participants are offered coffee breaks and lunches. 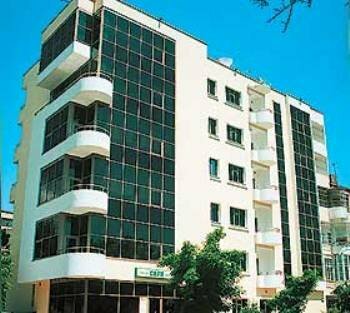 Other services of the hotel include: a guarded parking, laundry and dry-cleaning services, a restaurant and a bar, 24-hour services of the business centre, taxi call, car rent, air and railway tickets booking, a souvenir shop, a beauty parlour, a gym, a sauna, and safes.